Hudsonwoods from Tara Sgroi on Vimeo. As many of you know, we hosted an Autumn gathering this past weekend at Hudson Woods with some of our friends from the Hudson Valley including Arrowood Farms, Huckle & Goose and Ravenwood. If you couldn’t make it or even if you did, we’d like to share a video developed by our friend Tara Sgroi that captured the evenings festivities quite beautifully. Watch the video above. Of course, the food was also phenomenal so we asked Ravenwood and Huckle & Goose for a couple of their recipes. See the recipes below. Enjoy! Ravenwood is an old 4-acre cow pasture in Olivebridge, NY which was bought by chef, food stylist and grower Chris Lanier and his wife Dana McClure who is a visual artist and designer. 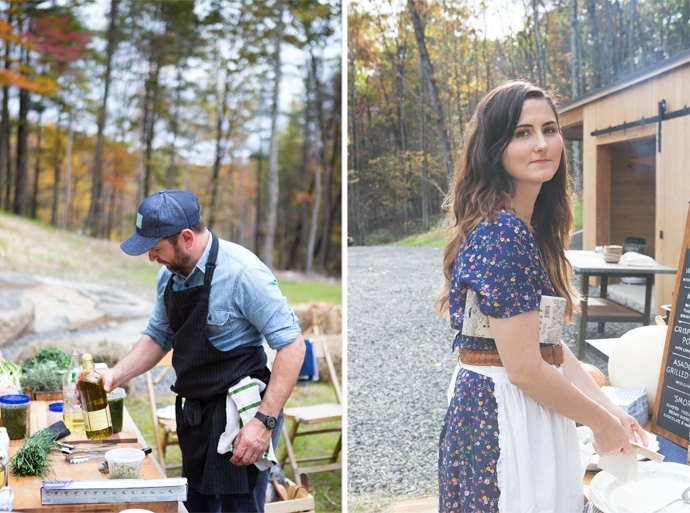 Together, they undertook the challenge of turning the place into a farm which gave birth to a series of dinner parties hosted in Brooklyn and upstate showcasing produce from the farm. Started by sisters-in-law Anca Toderic and Christine Lucaciu, Huckle & Goose prepares a curated sampling of seasonal meals and recipes to which people can subscribe and have delivered to their home every week. Each week, the ingredients and recipes are based around what’s in season at your local farmers’ market. Arrowood Farms crafted a custom brown Ale for Hudson Woods to fit the flavor of our Autumn gathering. For the brown ale they blended American Cascade hops along with English Fuggle hops; in addition to crystal, black and chocolate malts. Cascade adds a bold, floral and citrus aroma while the Fuggle brings fruity, spicy and woody undertones. Located in the Rondout Valley Arrowood is a one acre hops field with seven different varieties. While they will be supplying naturally grown hops for home brewers, nano breweries and micro breweries, as part of their research they will be experimenting with their own farm brewed ales and lagers. Kingston Wine Co. provided the fantastic wine choices for the evening; 2 inexpensive but delicious organic wines that reflect their philosophy of supporting farmers who work hard to enrich and preserve their land for future generations. Their wine making philosophy revolves around 5 distinctive tiers; Agriculture, Historic Normalcy, Context, Collaboration and Beauty. And of course, our own Brittain Stone mixed the Mississippi Bourbon Punch. Kaufmann Mercantile was also kind enough to provide a canvas field tent in which they actually camped the night of the event. Their cast iron fire bowl and fire-side leather camp stools also provided the perfect backdrop for s’mores and drinks. They even outfitted the chefs and staff with Shinola aprons. 11) Sauté squash in hot pan until it starts to brown. Some will be browner than others. 1) Cover potatoes in pot with water and salt heavily. 2) Cut garlic head in half crosswise, drizzle each half with oil, and wrap in foil. 3) Cut the rough spots off of the scrubbed beets (you won’t have to peel them) and place in a small baking dish with a bit of water covering the bottom. 4) Cover with foil and roast both beets and garlic for about 45 minutes until soft. 5) Let them cool enough to handle. Roughly chop beets and place into a food processor with beans, thyme, oil, salt and pepper. Squeeze in the roasted garlic out of the cloves, and give everything a whir for 5-10 minutes. 6) Add more thyme, salt, or pepper if needed and squeeze in the lemon. 7) Give the hummus a few more pulses. Serve with bread or crackers and salad. Garnish with olive oil and thyme leaves. *Butternut squash makes a fine substitution if you can’t find kabocha. 1) Cut the kabocha halves into wedges and remove the rind. Cut the squash into chucks and set aside. 2) Heat a dutch oven or soup pot over medium heat and add the olive oil. 3) Add the onion, carrot, and celery. Sprinkle with a teaspoon of salt and give a good stir. Sauté until veggies begin to soften, about 5 minutes. Add garlic and cook an additional minute. 4) Add the nutmeg, bay leaf, cayenne, black pepper, paprika, curry powder and cook for 2 minutes. 5) Add the squash and pour in the broth. Bring to a boil, and then reduce the heat to simmer. Cook until the squash is fork-tender. 6) Remove the bay leaf, and using and immersion blender puree the soup until completely smooth. Stir in half & half and taste for seasoning. Add more spices or salt if necessary. 7) Serve hot with crusty bread, crispy sage, or shaved Parmesan.